The Greenville, SC Comprehensive Plan completed in 2007 includes a chapter on Healthy Living and a Pedestrian-Friendly Environment which focuses on creating mixed-use residential/commercial areas; making urban environments biker- and pedestrian-friendly; creating community green spaces for parks and gardens; formulating design standards for Pedestrian Overlay Districts; encouraging healthy lifestyles (including improving food options); and evaluating health-related decisions (health impact assessments). 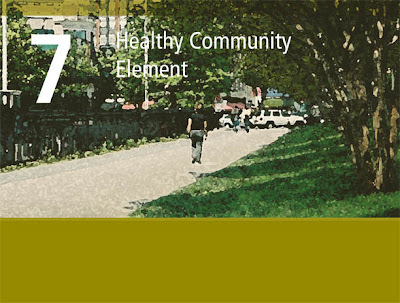 The Richmond, CA General Plan finished in 2009 includes a chapter on Community Health and Wellness which sets a critical path for improving conditions that will foster the physical health and emotional well-being of residents. The South Gate General Plan 2035 (located in the Los Angeles Metro Area) includes a “Healthy Community Element” which addresses South Gate’s key health issues and challenges including high rates of obesity; barriers to physical activity; lack of access to nutritious food and health care; unsafe streets for walking, driving and cycling; poor air quality; and vulnerable populations.